Let's learn English by English news! Dogs used to be thought of as guards, then as companions. Now they are being treated like children. No longer are they stuck with idiotic names like Fido and Fluffy: these days they get human names, such as Theo and Zoe. According to surveys, the majority of Americans see their pets as family members. 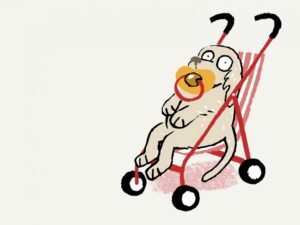 Those with dogs increasingly identify themselves as “parents” rather than “owners”. This is leading to a boom in the pet industry. In America alone people spend a whopping $44bn annually on pet food, supplies and toys, and that figure is growing. Last year they shelled out around $400m for pet Halloween costumes, according to the National Retail Federation. In 2017 they will spend $593m on Valentine’s Day gifts for their animals. The status of pets is changing for several reasons. Young people in the West are delaying getting married and having children. Millennials, lavish their creatures with the time and emotional energy that they might one day show a child. The kind of flexible work that many young people favour is more accommodating to pet care than a 9-to-5. Some companies trying to curry favour with employees, including Google, now allow dogs in the office. Others, like Genentech, offer subsidised doggie daycare. Just as parents invest in the physical wellbeing and safety of their children, they are also coddling their pets. Wearable devices for animals, which help owners monitor their dogs’ exercise in order to keep them slim, are an emerging trend. So are devices akin to baby monitors: “pet cams” let owners who are away from home keep an eye on their cats and dogs and talk to them through a speaker. You can now buy small mattresses made of memory foam, so your pets can sleep more soundly. 1. For many people, pets are an important source of love and friendship. It is also a well-known fact that pets are good for our health. Would you consider having a pet? What do you think are the advantages of having a pet? 2. Many pet owners treat their pets like humans and more so like their children. Do you think having a pet is a good practice / preparation for parenthood? What are the common care and comfort available to pets in your area? 3. Do you think it is morally right to spend a lot of money on pets, rather than helping people in need? 607 How about a bath instead of a workout? 677 Dementia Deaths Have More Than Doubled—but How Exactly Can It Kill You? 666 How Does Cold Weather Affect Your Heart Attack Risk? 655 Why Are Some People Left-Handed? 648 Is it possible to boost your immune system? 647 What will millennials kill this year? 617 Are food pesticides harmful to humans? 606 What to do about your noisy office? 583 What is brain fog? 582 What skills should everyone have by age 18? 573 Japanese Food Can Help You Live Longer: What Are The Health-Boosting Ingredients? 570 Alternative medicine is now a $30 billion industry. But does it work? 562 What’s the best work schedule for your age? 561 Why do kids go to school? Americans are divided on the answer, a new poll shows. 554 Will this be the happiest place in the world? 549 What Are The Best Ways To Prevent Cancer? 520 Is Saudi Arabia’s Vision 2030 realistic? 484 Are ‘chatbots’ the future of online business? 481 Why President Vladimir Putin will never allow loss of its own sovereignty and development prospects? 468 What are four of the biggest hazards of social media? 467 What If We All Went Vegetarian? 458 Why smart people tend to be loners: Having lots of friends and socialising makes intelligent people miserable? 453 Should Governments Tax Unhealthy Foods and Drinks? 402 Why power-hungry bosses sabotage teams? 389 Why New Year resolution may do more harm than good? A Harvard psychologist explains. 379 What does 3 months of Yoshinoya beef bowls do to your body? 347 Spaceports and sky farms: Is this how we’ll live in 100 years? 320 Is an entirely English-speaking village coming to Tokyo? 304 Is 45 the new old age in the workplace? 278 The Ice Bucket Challenge: How did it all start and what is it in aid of? Copyright© Pinas Speech Material All Rights Reserved.